American actor, best known for playing the titular character in 2006's Superman Returns, as well as for the movie Dylan Dog: Dead of Knight. On TV he played Daniel Shaw on Chuck and Ray Palmer on Arrow. In a 2006 article it mentioned his "Size: Stands just under 6 feet, 3 inches. He gained 22 pounds of muscle to play Superman." In SyFy.com he mentioned his weight "I gained about 25 pounds of muscle, and weighed about 225 pounds during the movie. Chris was taller than me. He was 6'4" and height: "I'm 6'2 ½", although in a 2017 video he claimed "I was 6'2 and 3/4 at the time, and now I'm 6'3 and a half." @GRIT He does not look 17cm taller than 173cm lowest Rob, let alone that and i see 6'2 1/2 legit how he look with Rob. I can see 189cm is a low for Routh. From picture above every cm is easily caught when its zoom to two person standing next to each other. To me, they all could potentially be from 6ft 2.5 up to 2.75 range more than 6ft 2.25-2.5 range. It would be hard to rank really. How would you rank all these actors in height? 6'2 5/8 Could be it. 6'2 1/2 Higher chance he hold this lowest of the day. 6'2 3/8 Also possible an absolute low. I could still believe 189.5cm before bed and probably easy 6'3 measure with the doctor office in AM. Grow a 1/4 is believable than 1/2 inch. Tom and Brandon are both Leaning, No Offense but that's a horrible picture to go by. Click Here: He is a recent picture of him and Tom welling. Welling is a fraction taller but routh is losing 2 cm in posture. It looks like Routh could be 1 cm taller than welling. I can believe 190 cm for ROuth but his claim doesnt make sense. He talks about the alexander techniqu in the video also. Maybe he really have gained 1 cm? 6'3 1/2 would be shoe height. At most i believe he could be measure 189.5cm before bed and hold the mystery 6'2 3/4 with Rob. But then someone like Geoff Stults was too honest than Routh recently came out claiming just 6'3 and he was like solid 6'2 1/2 maybe 6'2 3/4 tiny bit chance since Routh could be the same. His 6'3.5" claim doesn't make sense, unless he grew (which the chances are virtually zero). I would agree Rob. He kinda said "Well I was 6'2 and 3 quarters but now thanks to this program, I'm 6'3.5" type of thing. I would believe his original claim wholeheartedly, he definitely seems a 190 guy minimum 188. Maybe a bit like Lady Gaga having a joke that she was taller than her 5ft 2. Hey rob, Routh now claims 191 cm just listen to the clip provided start it at 10:12 and wait abit: Click Here I was very guttered! Nice find there, I will add that quote aswell to the top. The Human Garage makes you grow! Well, in shoes he surely measured that tall. Geoff Stults had more chance on the 6'2 3/4 than Routh. So, a guy like Fraser edges out Routh by a fraction, but in photos, they would look identical to each other. Rob, Do you think he is shorter than Chris Hemsworth? I would think they might generally look quite close if photographed together, but I still say Hemsworth has the better chance of measuring near 6ft 3 than Routh. People try to change heights on imdb by submitting trivia additions/corrections, and content editors approve/deny hundreds of these a day. So somebody guessed him that tall. I wouldn't list him that tall, in person he is shorter than strong 6ft 3 range people. Guys like Alastair Petrie or Gwendoline Christie up close are taller than routh. No chance for 190cm. Rob met Routh several times and if he is 6'2 5/8-6'2.75" Rob would have change his height for a long while. Rob, did he say himself that's he's 189 cm in the quote below? Also could you please do a pic with and mark selby? He was back to 200 pounds in legends of tomorrow. Solid 189cm before bed. @Zampo True. 6'2 3/8 settle down of lowest of the day. This listing fine. I personally think Brandon would measure closer to 189 cm than 190 cm. In fact, I think he would measure 189 cm flat in the evening. Rob, do you plan on giving Routh 6’2 5/8ths” for his estimated height? It's an arguable figure for him. In celebheights.com the more perspective people thought an actor a 1/4 taller which turns out to be legit listing. Routh i always thought 190cm when i watch him in a tv series Fear Itself that impression keeping me before i found out he was listed at 6'2.5" and met by 5'8 1/8 Rob in person. Rob had insist Routh a legit 6'2.5" in person so i wouldn't go above the range. I think Routh would measure 6'2.5"-6'2.75". Seems right, how tall would you say his wife, Courtney ford is? Bobby's actually 6'4.25". But it's strange that he's explaining it from a 6'3" guy's perspective. bobbyh3342- IF you are 6'3" and a 5'8" person only comes up to your chin. That measn your head from chin to top is 7 inches. 5th graders have heads larger than 7 inches. Not over than 6'2.5? What a joke, the less claim for him is 6'2.5", 6'2.75" would be better guess. Your saying he is 6'2.5", and I am saying he is not over that. So What's the problem? DIfference? Besides the ridiculous name you have chosen to use. i think brandon routh is one of the few guys who would measure in at 6´2 5/8. No way he is over 6'2.5. 6'3 is BS, I agree. Rob, has Routh ever claimed his own height/does his agency have him listed down somewhere? I've not looked for ages, but didn't see anything last time that was official, like an early resume. Perhaps the 5/8th listing would suit him better (189.5)? Can you please add Actor Brandon Molale who's listed at 6'4"? 6'2.5"-6'2.75", the 6'2 claims for this guy are a joke. Range 188.7-189 cm, he doesn't look a strong 189, probably he's shorter then Tom Welling by a fraction. Next to Zachary Levi (on Converse) he reach his height with an inch of shoes (191.5-192 cm), so with a footwear advantage. 189.2 cm is the best he can be. Surely he can be 6'3 in the morning, then 189.1-189.2 cm in afternoon then 188.7 cm in the evening. after all rob, brandon really looks bigger than fisher? Editor Rob: I would say Brandon will likely measure taller, though they don't look that much different in person. @Rob Paul: Here is another good photo of my dad and I. This was taken in the evening and he appears to have dropped down to 5’8” or so at this point. Can you give a good guess as to how tall I look in this photo? For some reason I measured myself at 6’1.25”ish which means I grew and maybe I have the potential of growing 2 more inches max but I want to make sure that I am getting the right measurements. People are saying I looking somewhere in between 5’11” and 6’1” or that I am 6’0” so probably I am about that height. When I used a wall to measure my height though on a flat ground, I got a measurement of 6’1.5” (187 cm). Which is far off from people’s estimates of my height. I had a good 5-6” on my brother though who is 5’7.5”. This is me standing at my tallest. Any guesses as to how tall I look? I am 230 pounds however so that extra weight probably makes me look shorter. Editor Rob: actually your Dad is slightly closer to the camera probably knocking a little height off your height, I'd still say you probably are somewhere in 6ft - 6ft 0.5 range. You might be looking at his moustache area if you ever met Brandon. @Rob Paul How much taller and how tall do I look in this photo with my dad who is 5’7.75” (172 cm)? I measured him myself during the day and he pulls off a weak 5’8” quite nicely. He was around 5’8” in his peak though. We are both barefoot by the way. How tall would I look next to Brandon Routh? Editor Rob: you seem in the 4 inch taller range, but maybe you could have better posture...in person you would still look a good couple of inches, maybe 3 shorter than Routh, who has a very naturally tall posture when you see him standing and walking around. Could be 6ft2.75 in a good day? Editor Rob: not impossible, though last time I seen him he didn't seem like he was that tall. Nearly 2 inches smaller than Jason Momoa, with not much difference in footwear, although he did look about 2.5 inches taller than Tom Cavanagh mind you! His eye level is only 6" Above Rob. Routh is over 6'2, but not a full 6'3. That is evident by the Photo, his hair barely reaches 6'3. Gwendoline Christie struggles with 6'3 in her Photo with Rob and you are giving her 6'3.5"? Why? Your are giving People you do not know extra height for some unknown reason. He is certainly 6’3” I think according to this picture of him with you. He can’t be under it. Has a good 7 inches on you it seems and there seems to be no footwear advantage on either of you guys. I would say he is as tall as Gwendoline Christie (who I would peg at 6’3.5”), or possibly a bit shorter. Maybe the same height as Chris Hemsworth as well. Editor Rob: Routh in person really seems near shorter than Gwendoline in person. I still would expect him to measure about 6ft 2.5. He looks 190cm here, assuming equal footwear. Tall dude. Yeah 6'2 tops for Fisher was what I got. 188 Tops. Routh is still most certainly taller than Fisher, not by Alot. Ray Fisher's eye level is at 5'9, Routh's 5'10". Routh also looks almost an Inch taller than Fisher when you compare them Side to Side by the top of their heads. Fisher- I had at 6'2 but forgot Rob mentioned he had more Footwear, 6'1.75". Routh- Still could be 6'2.75, Likely now around 6'2.5 still. Routh is most certainly taller than Fisher. Routh would have Cavill by 2.5-3" this means, Gents. Legit 6ft2.75, looks very tall. It’s more that the more I compare Routh with Fisher, the more I realize that he and Fisher are actually closer than most people think. I don’t think Routh is as low as 6’2” flat, but Fisher isn’t 187 cm as most people believe him to be. If that were the case, Dalton would be 5’10” at best. Agree with Dreampuff. His hair is the only thing taking him above 6’2”. He needs a downgrade to 6'2" if many people believe Ray Fisher is 187 cm. Rob, would you certainly say Brandon Routh would measure taller than Ryan Reynolds? I would say so for sure. Editor Rob: yes, I'd bet my collection of Steiff bears that Routh would be taller if measured..
Routh seems to have a smaller Head and higher Eye level but tha Rock's head looks to come up a bit higher in a couple of those shots. He is possibly taller than this and near 6'3"! The Rock is taller in the pics you posted. He looks 6'2.75". In the older days The Rock was listed as 6'2", but he appears to really be around 6'1" and Routh looks substantially taller than The Rock even though Mr. Rock is wearing his high heels. Click Here He holds up pretty well to The Big Show...6'3 in the morning. He’s nearer 6’3” than 6’2” imho. "Actually, someone even guessed solid 6’4” David Hasselhoff at 5’11”!!!" Who? So I can abuse them please. David Ramsey look solid 188cm and over an inch taller than Amell is true, that could point out just 185cm not under because all i see is a 3cm between Amell and Ramsey, because there is chance Ramsay might be someone holding few mm over 188cm although not quite the 6'2.25" marked. Click Here: can see position and feet. @Slim 6’ IKR! I have never seen a solid 189 to weak 190 person be guessed that low! Actually, someone even guessed solid 6’4” David Hasselhoff at 5’11”!!! That's because Amell most likely isn't a solid 6'1". Even Rob has said that he's probably 6'0.75". Also Amell looks around 184.5cm in the pic next to Rob. I think he's about 184.5cm or in the 6'0.5"-6'0.75" range. Good point, Ramsay even looks more than 1 inch taller than him. And let's face it, if Stephen was a legit 6'1" he wouldn't wear military boots and posture. I agree Routh look slight more than 1.5" on 6'1 Stephen Amell. I'm thinking of 6'2.75" not sure about 6'3. In arrow season 5, episode 8, he did appear to have 1.75"-2.00 inches on Stephen Amell. This would make Brandon 6'2.75"-6'3" or Stephen 6'0.5"-6'0.75"
More like 191cm out of bed, 186cm out of bed is fantasy land like Dreampuffe said. How in the blue hell can you look at the Picture of Brandon with Rob and get 6'1.25" ? Troll ? I think so......Either that or please share with me the Drugs you are on so I can have some please and "Float" through life . 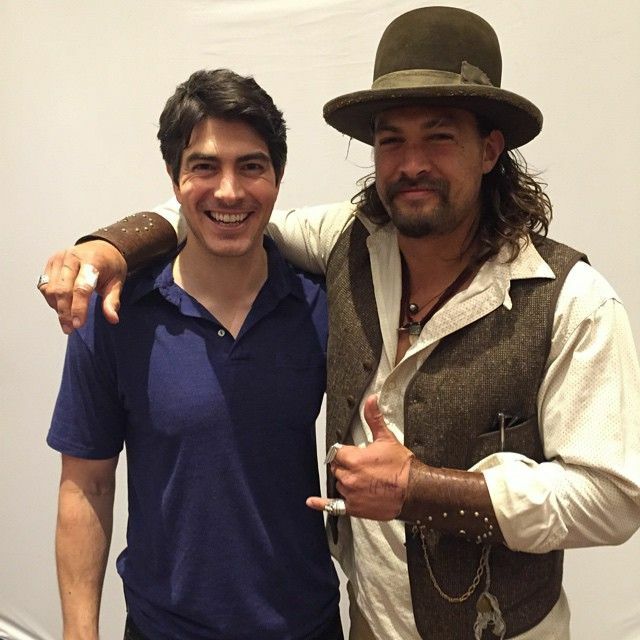 We’d have to downgrade poor Jason Momoa to 6’2” if Routh was really 184.5 cm. Dear goodness, Zachery Levi would be 6’1” at best. That’s in a fantasy land of bull s***tery. If talking barefoot,he is about 186 in morning. What's your opinion Rob. Editor Rob: and 184cm in the evening? I think it's as unlikely as seeing me as the next James Bond. Cracking the f*** up 😂. Hey rob, is that about 4 cm between routh and momoa? Editor Rob: I've seen Routh and Momoa together at 2 events...the first event in Collectormania years ago I believe he had less sandal than Routh one day and the difference wasn't as much as the second time...which I think in person could look near 2, but I believe Momoa had footwear edge that time. 186 cm? Bruh.... How much redbull were you drinking? This guy is a solid 189 to a weak 190 cm. Whoa!... So, Ray Fisher isn't really a 6'3" person then. Editor Rob: well I've seen taller 6ft 3 guys than Fisher, he could fall into 6ft 2.75 territory. This might be an odd question, and I totally understand if you hate being asked about it. Rob, who gave you a taller impression, Ray Fischer or Brandon Routh? Editor Rob: both are very close in person. he looks the same height as Gwendoline Christie. Rob, I know you're sick of answering these repeating questions, but is there at least a 1% chance Brandon is 6'2.75"? Editor Rob: of course there is a chance, how much of a chance? I'd say greater than 1%! No, Brandon is leaning in your photo so the word " Proof " should be taken out of your statement due to the horrible picture you posted. Have a nice day. Levi ( 6'3" legit) edges him out there so again this listing is solid. Routh is like Will Ferrell might hold 189.5cm at their lowest i guess. Agreed Rob. While you are a height expert, sometimes even experts can go slightly off track. For instance, let us take the average measurements of heads of six footers, I am not sure about the Ireland or rest of UK, but in India, many people who are legitimate 6 footers have 10-inch heads (Measurement from bottom of head to the point at the top - not the face, but the actual topmost point)/ Considering you stated Brandon Routh is only 6 foot 2.5 (The same height as my younger brother), I would assume his head is minimum 10 inches.Your head is right at the tip of his nose - subract 2-2.5 inches from the 10 inches - you still have 7.5 inches left. Let's cut 0.5 inches for hair and you still have 7 inches. Let's also remember you are slightly over 5 foot 8 - a centimeter or slightly over. Add 7 inches to your height and you get what I mean. If you disagree with me, you need to state that either Brandon Routh has a very small head or your measurement is slightly off. And really - how can you tell 0.5 inch difference without putting him below a stadiometer is below me. Sometimes, we have confirmation bias and we really stick to "figures" we believe as facts. Editor Rob: A photo is a guide, it sometimes does help give a good idea of the range a person might be, but of course sometimes a person can look taller/shorter. I am distanced from the celebs themselves - I am an observer, trying to guess height and provide what I think is a reasonable estimate to any visitors. Seeing Brandon in person numerous times, I haven't changed the 6ft 2.5. I've not seen enough to think he was near 6ft 3, although I can certainly understand others estimating that height, because on various tv shows he can look near it. For superman, he said in EW.com how he worked on posture and in person and on tv shows he seems to maintain the habits he learnt from his role as Superman. Rob - Two things I would like to consider here. He is standing in a slightly slouched manner or not completely erect - losing around 1-1.5 cms of height. I think this guy is a full 6 foot 3 - in his photos with Jason Mamoa and Dwayne Johnson - he looks 6 foot 3 easily. Also, he has tilted his head slightly towards the left while facing the camera, sometimes a slight slouch can also take half an inch from your height if you know what I mean. from the last few events I've seen Routh, he looks somewhere around 6ft 2-2.5 range. He might pass for 6'3 for 3 hours out of bed and hang till 6'2.5" before bed. What's his eyelevel (cm) in person? Editor Rob: a bit over 4.5, possibly it could be near 4.75 range. I would say out if bed yes Brandon is 6'3.25 out bed and his low is 6'2.75 . I think he needs an upgrade. Rob he is Now in his late 30's he was 26 when he did the superman movie in 2006 do you think In that he was maybe 190-191cm he seems a big guy with good posture but I can maybe see this guy lose a bit of height as he gets older. lots of guys his size tend to lose a bit of height around their early 30's whereas short guys with good posture can hold it longer than? Editor Rob: Routh still looks in great shape I think, I think he is a guy who will maintain good posture as he heads into his 40's and maybe still look this height by 50. Rob who would you say is taller Will Arnett or Brandon Routh? Editor Rob: think it would be hard to decide, you'd need to measure them to figure who might edge the other. That big? It looks tiny in pictures compared to his body! I thought for sure it would have been 9-9.2! I mean, it is smaller than yours, and yours is 9.5, right? Editor Rob: I'd have said it may actually be quite similar to mine, of course he has a thicker hairstyle. He looks taller, at least 6' 3'', in Arrow. 6' 4'' Colin Salmon looks only an inch taller. Rampage I'd say brouths night height is 188.5-189 cm. 190 cm isn't actually a stretch. 190 is overly optimistic, 189.5 sounds correct. may appear 6ft 2.5in but next to dominic and wentworth , he appears the full 6ft 3 - Could this be footwear? I would just keep him at 6'2.5". 6'2.75" is arguable too. OK Rob, but do you think that the guy like Tahmoh Penikett who is listed here 6'3" (I think believable because Penikett is 2-3cm shorter than 6'4" Victor Webster), is taller in person than Routh? Editor Rob: Tahmoh gave a taller impression when he stands tall...I think at times he simply never stand at his best. Rob, something is not right here. You said earlier that Routh is not a big 191 guy. But dou you think really that some genuine 6'3" guy like Kevin Sorbo bigger and taller than Routh? Or Zahary Levy? I saw the 2 seasons of Legends of Tomorrow and in some scenes (for example when the legends team attaced to the white house) the Routh guy was almost 10cm taller than Dom Purcell! I highly doubt than Purcell is under 6' so either Routh is a lift wearer or taller than 189. Dou you think Rob, out of question than Routh is 6'2.75"? In some other episodes (for example Invasion) David Ramsey looked taller bit he wore military boots. On the TV he can look tall and 6ft 3 is believable at times based on some shows he's appeared in. you'd think it would be highly unlikely for guys in 6ft 2-3 range to bother with lifts. based on the last occasion I seen Routh, I still wouldn't go above 6ft 2.5. I agree that Routh will measure taller than Reynolds. In comparison to standing with Hugh Jackman, Brandon Routh stood taller than how Reynold looked next to Hugh Jackman. Routh would measure taller than Reynolds. @Dejavu: True and if Miller is 6ft1 which many argue he is....Routh looks 6ft3! He looks 2 inches taller than Wentworth Miller. I don't think he is shorter than 6'2.5. Haha. Someone will use the recent picture with kobe disadvantage from camera to say phelps make kobe look 6'4?? yet the truth kobe is probably solid 8cm taller than michael phelps. Now i'm not surprise if rob atually met routh on his good day standing at 6'2.5 and normal day could just be 6'2 or routh is just 6'2.5 in the early morning. Like i say before other celebrities mostly get listed 2cm higher. Michael pehlps is only 187cm like i discuss in jeremy lin page and brandon routh is not as tall as we think. @S.J.H. Doubt it. Phelps actually makes Kobe Bryant look 6'4" flat and actually edges out 6'2.75" Prince Williams. his skull and frame is smaller than i expected, he is quite medium framed for his height surprisingly. Another arguable 190 cm person like Routh is Michael Phelps. I would honestly give this guy a full 6ft 3 (or 6ft 2.75), he looks near 4 inches taller than Grant Gustin who claims 6ft 1.5! He could be 190 cm which is what I would put Routh. This guy always looked 190cm to me. He's leaning in slightly towards you Rob, perhaps sacificing 1cm at least. I'm going with 6'2.75", as most other people are doing. In the picture with Rob he looks 6'2-1/2" more I look at him. His hair doesn't give him that much height, top of his head should still clear the 6'2" Mark a bit. He usually stands out in whatever room he is in. Jackman was a solid 6'2" at peak. Also, 6'2.75" for Brandon Routh. @German 185 cm max and 183 cm minimum? that was peak Jackman. Not many people are taller than him. Routh is an exception along with Ben Affleck. Routh has always looked taller than flat 6'2". If Routh were just 6'2" flat, we would have to downgrade a ton of celebrities here. Editor Rob: shiva, I wouldn't rule out the chance, but I'm thinking the 189 is a best guess. I would say he could be argued anywhere from a strong 6ft 2 to a weak 6ft 3. Rob, do you know what he claims? Editor Rob: I haven't heard a direct claim from what I remember, although early in his career he was called both 6ft 2 and 3. So when you dont mention footwear then footwear is the same? Editor Rob: yes within a few mm's. I've always seen routh as closer to 6ft3 than 6ft2.. he looks a solid 190cm to me and I saw this picture with Dwayne Johnson which shows it quite well IMO. What do you think Rob? Worthy of an upgrade to 6ft2.75? If not 6ft3?? Editor Rob: the last time I seen him (and it was several times over a weekend up close) I wouldn't have guessed him any taller than 6ft 2.5. Rob, I can't see Chris Hemsworth 2cm taller than Routh, what do you think ? Editor Rob: it's more like the half inch at most, it's just rounding the cm value. 6ft 3 is one of those rare marks that is 190.5cm, so you could round it either way to 190 or 191. I think edging toward 190cm when he stands tall. Rob did he look only 188-188,5cm last time you seen him ? Editor Rob: he really didn't seem as tall and he didn't have much different sneaker. I was right beside him a few times, whereas standing beside Momoa again I felt that guy was near 6ft 4. As listed . Rob do you think he would wake up at 6ft 3.5 ? Editor Rob: yeah he might be that range or near it. Rob, do you agree routh can also pull off 6'2.75? Editor Rob: yes he can look that range with people...saying that, last time I seen him he didn't seem as tall, I'd have guessed 6ft 2.5 max last time, but previously he was a solid 6ft 2.5er. I think 190 is more suitable. His eye level is around 177 cm, so 189 cm should be fine. Agree with Rob... I am sure he can give a taller impression than 6'2.5 at times on the screen but i don't think he's over this listing! Rob showed a picture with a 6'2.5-6'3 guy and Brandon looks shorter than him! Don't base your guess on people that Rob hasn't met... It is true that he can look at least a big 6'3 guy with people like Christian Bale, Kevin Spacey and Hugh Jackman but those guys are all overlisted! Bale is probably 5'11.5, Kevin 5'9 flat and Hugh has never been over 186-187... 189 is a good listing for Brandon! @Rob: Since you are the expert, I will agree. However, before I end our argument a small fact. I measured myself in the morning and night for three consecutive days and got a minimum of 171+cms in the morning and 168.5+cms in the night. My brother, Navin, is similar to Brandon in height, only difference being he is dark in complexion and is also around 6 foot, 2.5 inches (Measured during afternoon). We are all guessing on here, and you find guesses for any celebrity will vary over a range. If you estimate him near 6ft 3 no problem (in some movies/shows he has looked it), but in person my feeling was somewhere between the 2 and 3 range...but I don't dismiss the chance of somebody being above/below a guess. @Rob: I was going through your videos, Rob, You have listed yourself as 173 cms minimum and 175.2 in the morning. Now, considering that you fully know your height, I am sure you will agree with me that there is no way that you are less than 18 cm shorter than Brandon Routh in this photo. I can easily place a half a foot scale on your head in the photo and yet it will land up well than an inch short. I think Brandon might need an upgrade by 0.5 inch. I know you feel he doesn't look tall, but I saw Superman Returns yesterday and i was able to see him tower half a foot for Kevin Spacey in every frame. I do agree that IMDB (That exaggerates heights) shows him at 6 2.5, but please do remember that Actors do understate heights in Hollywood as they cant get roles if they are over 6 foot 2. Even Hugh Jackman stated this in one of his interviews. In all pics, Brandon Routh looks a strong 1 inch taller than every other 6 foot 2 footer, you can refer to his pic with Dwayne Johnson (Who is now 6 foot 2 or 2.25) and compare Dwayne with 6 foot 3 Chris Helms. Hope you get the picture. From the pic shown here, I see a strong 190cm tall guy. I didn't think his hairstyle was any less than half inch. My impression I get is above 6ft 2 flat and under 6ft 3 full. Of course that doesn't mean I'm right or wrong, it's just my estimate based on seeing him a few times now. @Rob - Dear Rob, I think you really need to upgrade Brandon Routh or downgrade Kevin Spacey from 5 foot 9.75 to 5 foot 8 as stated in this site. I have seen Superman Returns, and I have seen several photos of Brandon Routh with Kevin Spacey, Christian Bale, and Hugh Jackman. I can clearly see a Strong 6 foot 3 to 3.5 footer. I understand that you are using a height app and have a better understanding of height difference, but when a 6 foot 2.5 inches person towers more than one inch over 6 foot 2 Hugh Jackman and 3 inches over CHristian Bale, i really start doubting the camera angles and the app. What do you say, Rob? Editor Rob: I don't know if he towered 3 inches over bale, some of those photos Where taken here...bale's right foot is on a downslope. In person Routh doesn't look a big 6ft 3 guy. Here is clear pic, where both are standing tall and Brandon is a clear 3 inches taller than 6 foot Christian Bale. If you feel these are valid, kindly downgrade Christian Bale or upgrade Brandon Routh. He's definitely above the 6'2 range for sure. A good example of a strong 6'2; 6'2.5. He can pull off 6'3" at times. On Arrow he comfortably clears Vinnie Jones in one scene and the difference looks similar to Paul Blackthorne who is a legit 6'3". Good posture and proportions do alot. Editor Rob: I'm not saying it ends at 6ft 2, I think his hair is 6ft 3ish, but his hair isn't flat it has some volume. If it was less than half an inch I'd be surprised. 'Lois,how tall would you say Clark is? Brandon Routh may play a superhero on his Thursday CW series “DC’s Legends of Tomorrow,” but at least this time he didn’t have to bulk up for the role. And for that, he is thankful. Back in 2004, the 36-year-old Iowa native had to add more than 20 pounds to his lean 6-feet-2-1/2-inch frame to play the Man of Steel in the 2006 theatrical feature “Superman Returns.” The training regimen, he recalls, was rigorous. Routh is pretty tall, but I guess is not a 189 cm barefoot, maybe is 188 without shoes. Routh's height is spot on. Levi was more than an inch shorter than Conan. So Rob, you think Welling is holding 190cm range into the evening while Routh is down to 189cm at his low? Editor Rob: I think he would probably hold it, welling may not drop to a flat 6ft 2.5, but still hold that smaller fraction under 6ft 3. Rob, who would you guess as taller Routh or Welling? 6'2.5"! no doubt about his height! Hey this is how tall my "6 foot 4" cousin looks next to a 5 foot 8 person in my family! Oh wait. You can do basically everything with this height. Pick up every woman, still move comfortably and not stiff, play every sport except maybe for gymnastics or equitation. Always have clear view but not stand out from the crowd when not feeling like it. Lucky man. Listing is very good. Just wondered if the heights on this website represent the average heights of these people and not the lowest heights of the day or late afternoon when they'll be below their average. I'm 6'1" at 11am and this happens to be my average height. (6'1.375" out of bed and 6'0.625" before bed) several people I know also are at their average at a similar time of day. This listing is spot on. A genuine 189 cm person ( lowest height) barefoot is an awesome height to be. Rob, who do you think would be taller between him and Chris Hemsworth? [Editor Rob: actually the 5ft 11.5ish guy recognised me as my face was 'everywhere', I've no idea what site he visiting but then once you put photos up on the web you have to realise they can be shown anywhere without much care! Rob, would you have given to him if you didn't meet him? I mean, if you compare him to the other guys on here, he really can look a big 6'3! He looks at least as tall as The Rock (in some pictures he actually looks taller), he looked a solid inch taller than Hugh Jackman, when he was only 38, so still near his peak! if you wanna be coherent, you should list him 6'3.25! Of course, he's not that tall though. I think he's just a solid 6'2.5, as listed! [Editor Rob: possibly 6ft 2.75...I think he has a good physique and posture, I would say 6ft 2.5 could be his after tea height, he may well be 6ft 2.75 at lunch range. Well, if you wanna believe in a 6'2 "peak" Hugh Jackman (that picture was taken in 2006, so i doubt Hugh had lost any height), Brandon does look a big 6'3 guy at least, yeah... But i dont think he's more than his listing! Good chance 189 is his low, though. A big 189 is what i think he'd measure!